Children and adolescents are not just small adults…and counseling with children and adolescents should be done in a way that recognizes this. 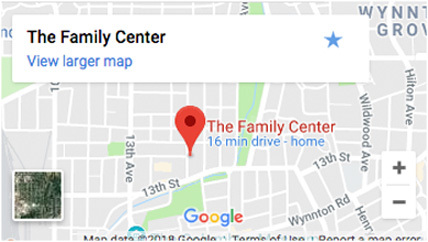 At Family Counseling of Columbus, our counselors and counseling interns appreciate that the needs, styles, and developmental tasks of children and adolescents require a special approach to counseling with them. Before any counseling can be provided to a minor, the parent or guardian must first give their consent for them to receive services. Parents/guardians are fully informed of any assessment findings, treatment recommendations, and other information regarding their child and his or her progress, and have the right to review any written information in the child’s clinical record. We recognize that for small children, PLAY is their work and the way that they express themselves and their feelings, explore solutions, and test new skills and abilities. Play therapy techniques, theories, and approaches are incorporated into our work with our littlest clients, ensuring that the counseling office and the counseling process are welcoming, friendly, safe, and a fun place to be. Rather than seeing your child sitting in a chair, talking with the counselor, you are more apt to see your child drawing, coloring, playing a game, playing in a sand tray, acting out a play or playing with puppets, or doing something else that looks more like play time than “therapy”. Rest assured that therapy is really what is happening! Depending on the age, abilities, and needs of the child, sessions may be shorter than the traditional 50-minute counseling hour. Sometimes parents are included in the sessions and sometimes not, depending on the situation, the recommendation of the counselor, and the wishes of the child client and you as their parent.…but parents always have input into the process and are kept fully informed and aware of how things are going. Developmental issues and privacy – adolescents have to deal with the process of separating themselves from their family identity and forging their own individual selves. By nature, and as a part of the normal maturation process, they are more closed and less communicative than many parents would like. For this reason, the concept of privacy and confidentiality are of critical importance for these soon-to be-adults. Your teenager’s counselor will talk with the both the client and parent/guardian to negotiate an understanding of, and an agreement on, what information will be shared with you as the parent, and what information shared in individual counseling might be allowed to stay private between the teen and his or her counselor. Being respectful of adolescent’s need for a safe place to share will help guarantee that your teen can build the level of trust and rapport with his or her counselor that is needed to insure that counseling can be beneficial. No counselor will ever withhold information that relates to your child’s safety, health, or physical / mental well being. Negotiating power and control – pre-teens and teens sometimes feel the need to control their environment and what they do in it. It is not unusual for adolescent clients to want to “steer” the process of counseling by not talking, not complying with homework given in counseling, focusing on other topics, etc. Often, a reluctance to “work” in counseling on identified issues may be a sign that more time is needed to build trust or that a topic may be particularly difficult to address and the adolescent needs to “protect” themselves a bit longer. Our counselors and counseling interns appreciate the need to “pick and choose” battles; it is not unusual for parents to wonder what if anything is being accomplished, or worrying that their uncommunicative teen is not progressing in counseling. Your adolescent’s counselor will balance your child’s need to set the pace and the goals for counseling, and will keep you informed about the progress that they are making.